If you’re looking for an all-inclusive Cancun beach resort with a biggest-and-the-best attitude, the Iberostar Cancun Hotel (formerly the Hilton Cancun Golf and Spa Resort) is perfect for your family. It is, in fact, the only resort in Cancun to include a championship golf course among its facilities, which makes it ideal for multi-generational family vacations. If dad is looking forward to the on-site golf course, then mom can count on the in-house spa and the largest white sand beach of any Cancun resort for the entire family to enjoy together. Spending over $100 million on the purchase and renovation, this five-star hotel complex became the Iberostar’s eighth property in Mexico. With 426 guest rooms, the large all-inclusive Iberostar Cancun offers the traditional hotel comforts and variety of facilities you might expect in a former convention property. Guests can enjoy — at no extra cost — the hotel’s seven infinity pools, professional soccer field, two tennis courts and gym, in addition to extra plus-size embellishments, all in a recently refreshed package. The property, one of Cancun’s earliest resorts, is also beautifully landscaped with mature trees and flowering plants. Families can choose from one of over 200 ocean view rooms (99 of which have a balcony), more than 50 garden view villas, two villa beach suites and 20 other suites ranging in size and amenities. With regular rooms starting as low as $155 per night all-inclusive for room, board and pina coladas; Iberostar Cancun makes a full-service tropical beach vacation feel both luxurious and affordable. Golfing at the Iberostar Cancun is special; it’s much more than a traditional experience on the greens. With 18 holes spread out over 6,700 yards of Bermuda grass peppered with move than 80 sand traps, this par 72 golf course is a destination in itself. Here, practice your swing while surrounded by some of Cancun’s most exotic wildlife. Peacocks are rumored to welcome visitors to the course, and crocodiles, iguanas, and tropical birds of every color make their home in the mangrove jungle that surrounds the green. The Iberostar Cancun is also convenient. Like many of Cancun’s hotels, it is located only 15 minutes away from the Cancun airport, allowing for easy arrivals and departures. The Iberostar Cancun is also incredibly close to the downtown and historic districts of Cancun Centro, making it easy for families to get out and see the sights, shop, or dine out at a fabulous local Mexican eatery on their own or by local taxi. Dining in is also an option — and it’s free. At the Iberostar Cancun, guests can choose from any of five in-house restaurants. But when making your dinner plans, remember that there is an “elegant casual” dress code for all of the hotel’s á la carte restaurants. For all gentlemen over 12, that means closed toe shoes, long pants, and shirts with sleeves. If you’re not feeling particularly snazzy, casual is an option, too. Just be sure to make your reservations at the El Laguito Buffet Restaurant, and not one of the four gourmet establishments. While the Iberostar Cancun does not offer as many kid-friendly activities as some of the more pricey hotels, it does have one added family draw (aside from the golf course): The Iberostar Cancun is truly an all inclusive resort. What does this mean? Well, for Mom and Dad, it means free drinks at any of the hotel’s four bars. The entire family can also enjoy all inclusive dining at any of the hotel’s restaurants for breakfast, lunch, and dinner. Room service is also included in this deal, so go ahead and satisfy that midnight sweet tooth. 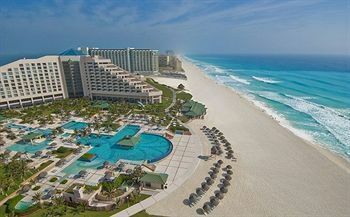 The all-inclusive package also includes complete access to all of the Iberostar Cancun’s sports facilities. So go ahead and play a family game of table-tennis, or real tennis. Aerobatics, gymnastics, volleyball, and football, too. Photo courtesy of Trip Advisor.